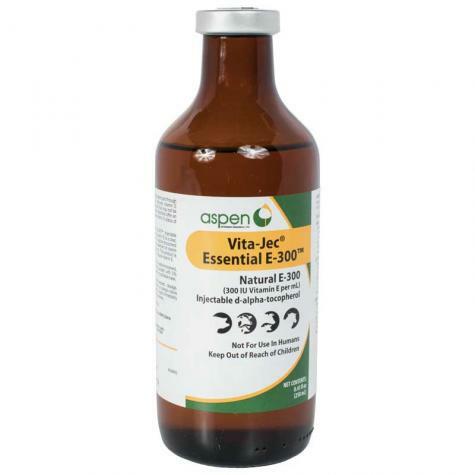 E-300 is a clear, sterile, nonaqueous solution of d-alpha-tocopherol for use as a supplemental source of natural vitamin E in swine, cattle and sheep. Natural tocopherols in feedstuffs can be destroyed through processing, ensiling and storage. A reduced vitamin E intake can result in marginal deficiencies that may not be visible. Intramuscular or subcutaneous injections offer an efficient and rapid method to increase the vitamin E status of animals. Use as a supplemental source of natural vitamin E in swine, cattle and sheep. Each ml contains: 300 International Units of vitamin E (as d-alpha-tocopherol, a natural source of vitamin E) compound with 20% ethyl alcohol and 1 % benzyl alcohol (preservative) in an emulsifable base. Administration and Dosage: Intramuscular or Subcutaneous Administration Only. May be repeated as needed. If dosage is greater than 5 ml, equally divide the dosage and inject at two different sites. Important: Store between 36˚ and 86˚F in a dark place. Store partially used vials under refrigeration (36˚- 55˚K). Suggested Dosage: See PDF above. For lambs with stiff hind quarters (possibly white muscle disease) inject 600-800 IU Vitamin E per lamb every day for several days. Intramuscular or subcutaneous injection only. Anaphylactoid or allergic reactions, which have resulted in deaths, abortions, and/or premature births, have been reported in individual animals as well as entire herds. Should such reactions or hypersensitivity occur, treat immediately with injection of epinephrine and/or antihistamine.